I have a newer friend who doesn't really know how to cook, or bake. She tries, and when she tells me about her trials I can't help but note to myself that cooking and baking are definitely arts - and the arts come easily to some and not so much so to others. Not that you can't become a better cook or baker by simply working at it: this is the point where I think personally I have arrived. After you do something enough times, you stop worrying if you are doing it right, and you just do. When considering that I wanted to have a nice dinner for my family yesterday evening, I didn't really know where to begin. I didn't even know what I had a taste for. I had soaked and cooked a half pound of pinto beans and had them ready in the fridge for several days, just waiting for a application, and that seemed like a good place to begin. I'm not always one to rely on printed recipes anymore, but I do frequently use them as inspiration - and I even will admit that I truly love the Epicurious iPhone app for just this reason. (Though this isn't really a technology-related post, I'll even go further to say that I would probably be a perfect candidate for the iPad or other tablet device solely for kitchen use. I do not have one to date.) Epicurious has made their entire library of recipes available, decades of Gourmet and Bon Appetit magazine pages right there for me to filter. I typed in "pinto beans" and found what turned out to be the most delicious version of pot beans I've made in a while - Dominican Beans. It wasn't long until I ran an errand to pick up some fish for tacos and just like that, dinner was served. Because every nicer dinner at home should also have a dessert, I also searched the app for a suitable starting point that could make use of the bowl of ripe pears I had on the table and the leftover empanada dough I had in the fridge. I was just a few taps away from one of the best fruit desserts I've made in some time. Like my kitchen-challenged friend, there was a time when I would have been uncertain where to start in altering a printed recipe to use what I had on hand. I believe that the world of food blogs has opened a brave new world of opportunity for home cooks; we now have the empowerment to be creative and alter for alteration's sake - improvising to suit ourselves and to share not only with friends and family, but a growing "audience" of new acquaintances who can hopefully also learn and alter along with us. 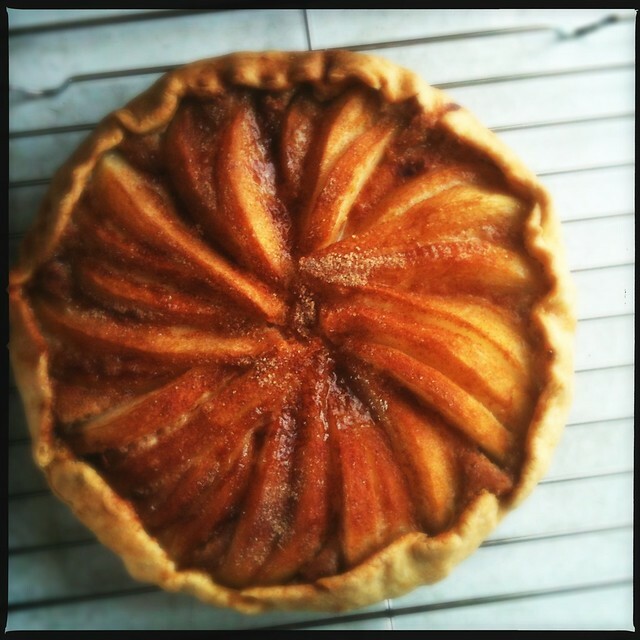 This improvised pear almond galette actually started long ago. 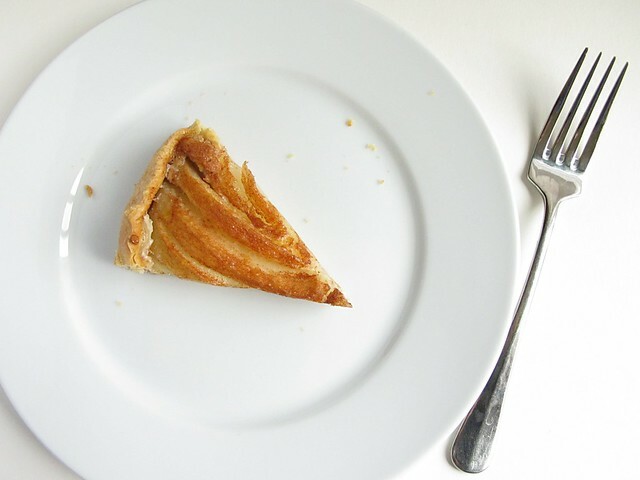 Back before I had ever made a single tart, I had picked up a tart pan at a discount store. It is an odd size, 7 inches across the bottom and 8 when measured across the top. Now I thought most tart tins had straight sides, but that could be why I found the pan in the first place, neglected in part because of a non-conformist nature. My Daring Baker Challenge emplanada dough last week left a lot of scraps to be re-rolled... and I did re-roll it and then store it in a plastic bag on a plate so it would remain round and flat. Days passed. Pears ripened. Lemons were gone and oranges and limes were all that remained in the crisper drawer. And finally my galette was formed with the help of all of these happenstance things. My Husband loved it, which is also definitely something to record! 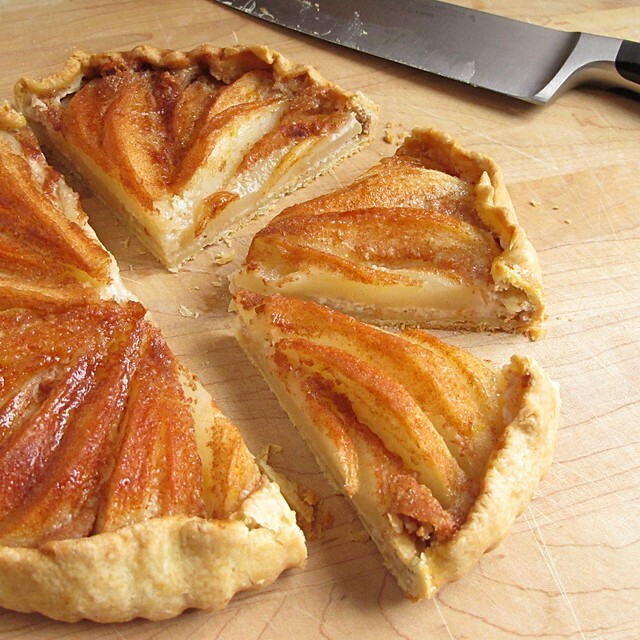 Galettes are technically free-form pies, some of which are nearly covered completely in flaky crust. 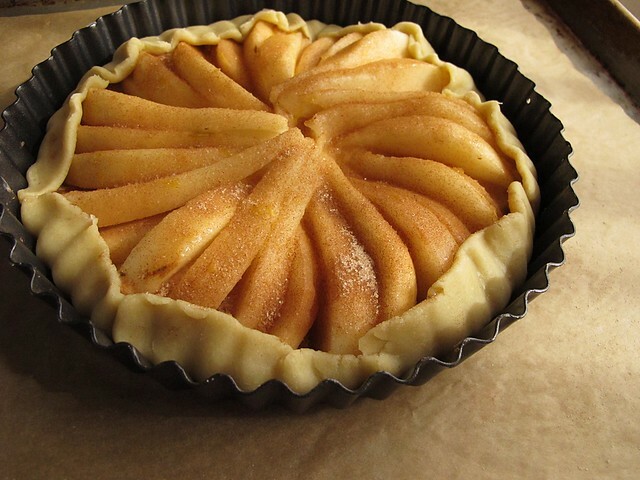 I used my tart tin to keep everything initially contained, and then removed the form halfway through the baking time so that it would brown uniformly. The original recipe link has a pastry crust recipe that include a little extra dose of almond extract, if you use your favorite pastry, do as I did and increase the almond extract in the cream layer. Preheat the oven to 400. 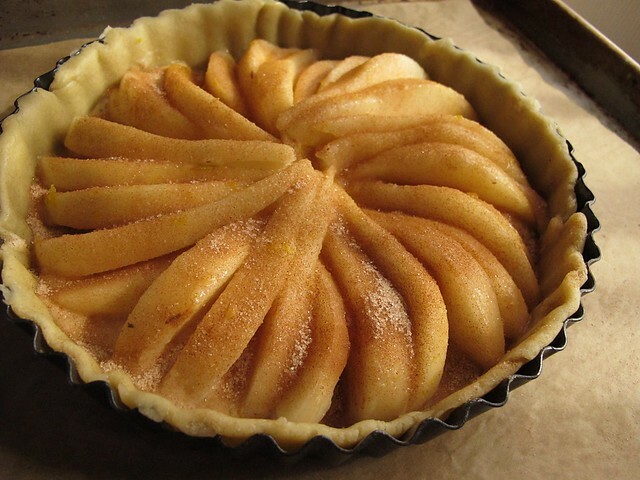 Line the tart tin with pastry crust that is rolled to about 1/8 inch thick. Peel, core, and slice the pears into 16ths (cut each quarter pear into 4 slices). Place carefully in a large bowl, and grate the orange zest over. Mix carefully with your hands so the slices remain whole. 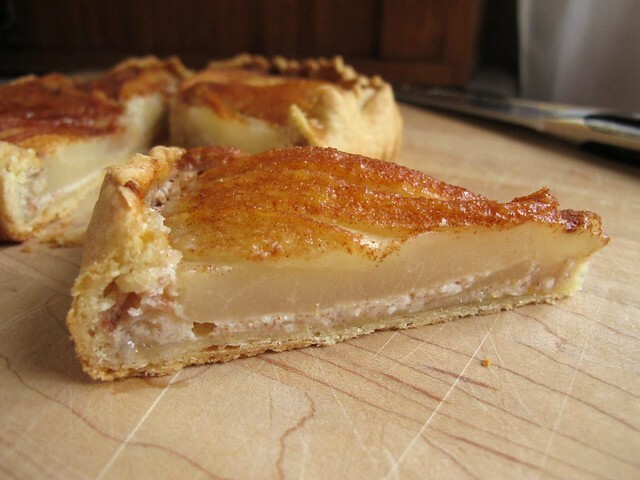 Take the cream out of the fridge and pour it into the center of the pastry. (I shook a layer of cinnamon-sugar over the pastry crust first, since my crust was not sweetened at all.) Beginning in the center, arrange the pears in a concentric way. Two pears fit my pan exactly, with two slices leftover for me to eat. Shake cinnamon-sugar heavily over the top, and carefully fold the edges of the dough down gently over the edges of the pears. Turn off the oven, but turn on the broiler to high. Dot the top of the galette with a few bits of butter and another shake of cinnamon-sugar for good measure. Place under the broiler for a minute or two until the top is bubbly and deeply caramel colored. Cool the galette on a wire rack completely before slicing. I stored the leftovers in the refrigerator due to the eggy bottom layer, and it was as good cold the next day as it was the day of at room temperature. The pears keep their firm "pear-ness", and orange and almond are always happy company. Even though I may have liked my crust with a bit of sweetness, I really liked the crunchy, plain pastry flavor of the one I used - and I had the bonus pleasure of using up something already on hand. It is possible that all recipes are merely suggestions. When I read through Michael Ruhlman's Twenty earlier this Summer, I recall him stressing heavily that to cook well, first think. Whether using a recipe or an idea of a recipe, thinking through your process before beginning is a probably the best way to start. Surprise and stress is greatly reduce when your brain is the first thing you consult in the kitchen... and no matter how experienced you are in those arts, it is always a good reminder. I used to think that anyone can cook. I still do actually think this, but I've also come to realize that it is just as important to recognize that there are people who just love to eat and who simply really appreciate eating great food. I am never happier than when I find new friends of this nature, those with whom the pleasures of sitting around nibbling on somethings are the greatest joys. Being at home in the kitchen or not is no longer the issue, but the acknowledgment of good taste is.